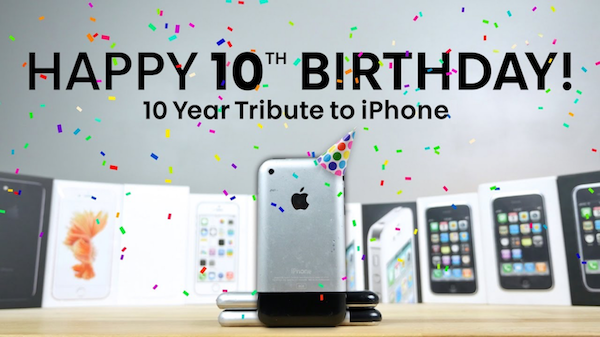 The iPhone began a smartphone revolution when it was revealed 10 years ago. Steve Jobs’ vision for the iPhone was “a widescreen iPod with touch controls, a revolutionary mobile phone, and a breakthrough internet communications device.” Revolutionary it was, in more ways than Jobs himself could have anticipated—the iPhone today has transformed the way we communicate, interact, get information, and connect with the world. It has created industries and charted the rise and fall of companies, consolidating hundreds of previously-indispensable items from cameras and video recorders to wristwatches, flash drives, books, notebooks, calculators, guitar tuners, even keys and wallets. Throughout these 10 years, the iPhone has grown to be the symbol of the tech industry; some even say the iPhone can be considered the most profitable product ever. There are 715 million iPhones are being used worldwide and 2.32 billion smartphones currently in use all over the world, fully normalizing what was once seen as a niche product. As the first mobile phone operating system based on a computer system, iOS impressed a lot of people when it was introduced in 2007. With an iPhone consumers were now able to access high speed internet almost anywhere in the world from a device that can fit into your pocket; in November of 2016 mobile internet usage surpassed desktop usage worldwide. Today, the iPhone is everywhere. If someone owns an iPhone, it is very likely that the phone is with them at all times of the day and night. Consumers are able to send text messages, call, and video chat at any time because they can connect to the internet anywhere. With this instant communication, the iPhone has transformed the way we interact with our world. This device allows for people to have access to news stories the minute they are published, altering the who, what and how of information is shared. People can join conversations over the internet about issues in the news, and they can spread ideas and opinions through blogging and social media. The world is more connected now than ever before, and society now relies on the smartphone for all of their information. The iPhone is built around the concept of instant gratification, making almost anything available to the consumer immediately. With the internet now accessible to everyone anywhere through their iPhone, people are constantly connected to each other and to any number of services. Shopping for anything is now available with a swipe of our finger; grocery stores deliver to your home via your phone, money can be transferred and invested, entire TV shows streamed, and turn-by-turn directions navigate us to any destination. The on-demand and gig economies are thriving, collectively changing the way we value and consume resources. What does this mean for the future? Is this good or bad for society? Only time will tell, but it can safely be said that without the introduction of the iPhone 10 years ago, we would not be where we are today. As sales continuously go up, especially in the United States, more and more people are taking advantage of the iPhone’s revolutionary features. Owning an iPhone or smartphone has become a social norm, and those who don’t may find themselves frustrated by a rapidly-adapting society. The world is increasingly going mobile and the iPhone is the leader of the mobile technology revolution.